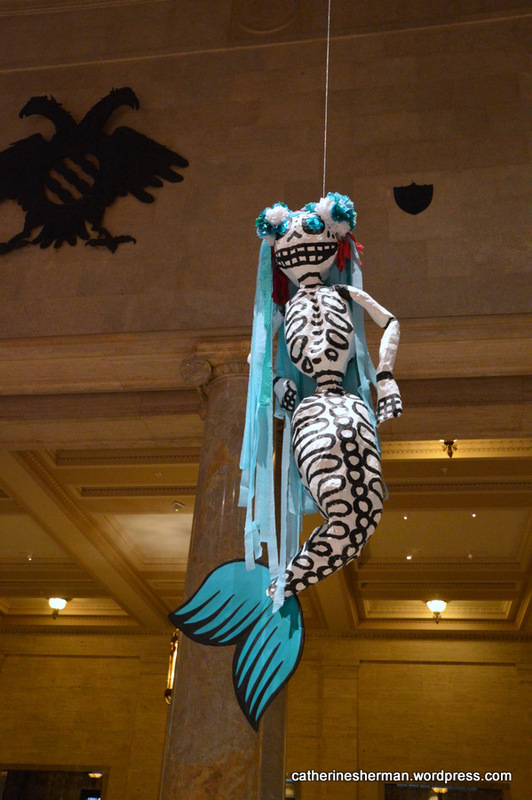 A Paper Mache Mermaid Skeleton hangs in Kirkwood Hall at the Nelson-Atkins Museum of Art in Kansas City, Missouri. The skeleton is one of four hanging in the hall for the Day of the Dead (El Dia de los Muertos) festival planned for November 1, 2015. 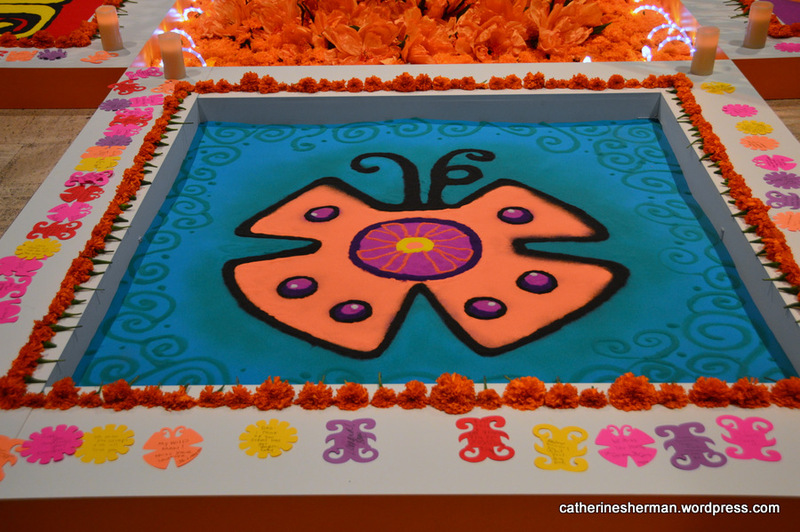 Sand paintings in an altar are also featured. 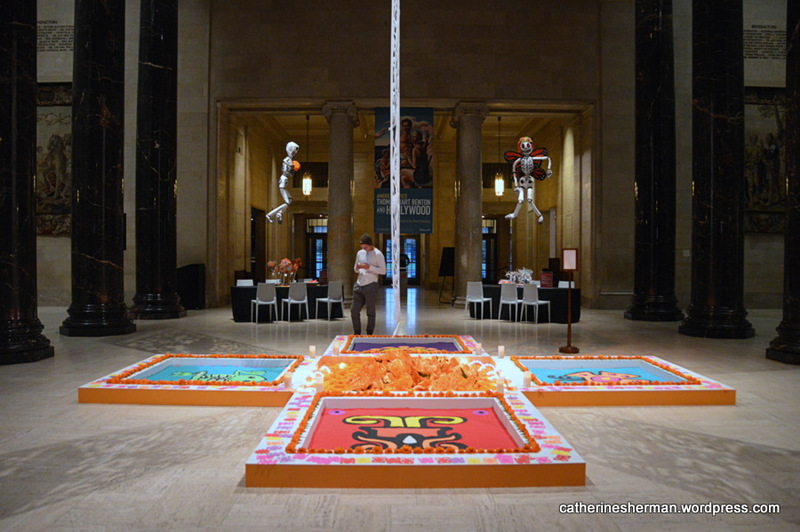 There are always activities at the Nelson-Atkins Museum of Art in Kansas City, Missouri. The museum’s exterior lights were bright blue in honor of the Kansas City Royals basbeall team being in the World Series. Guards were wearing Kansas City Royals t-shirts. 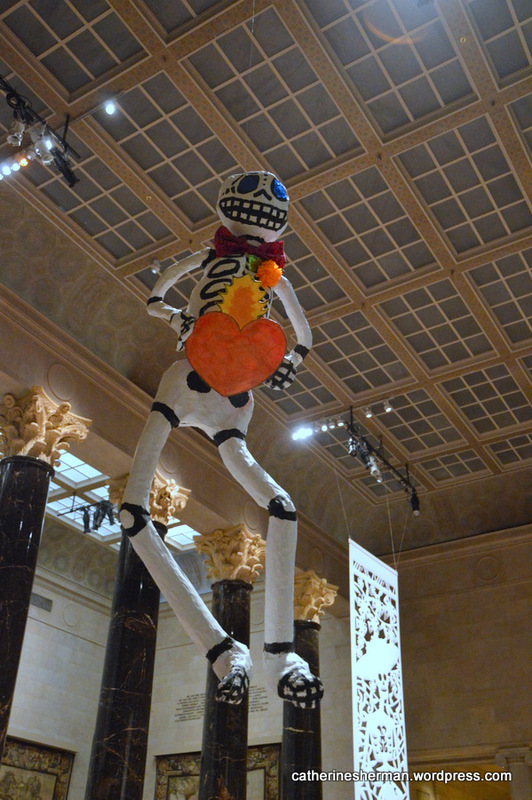 Inside, in Kirkwood Hall, four paper mache skeletons hung from the ceiling for the museum’s Day of the Dead Festival. 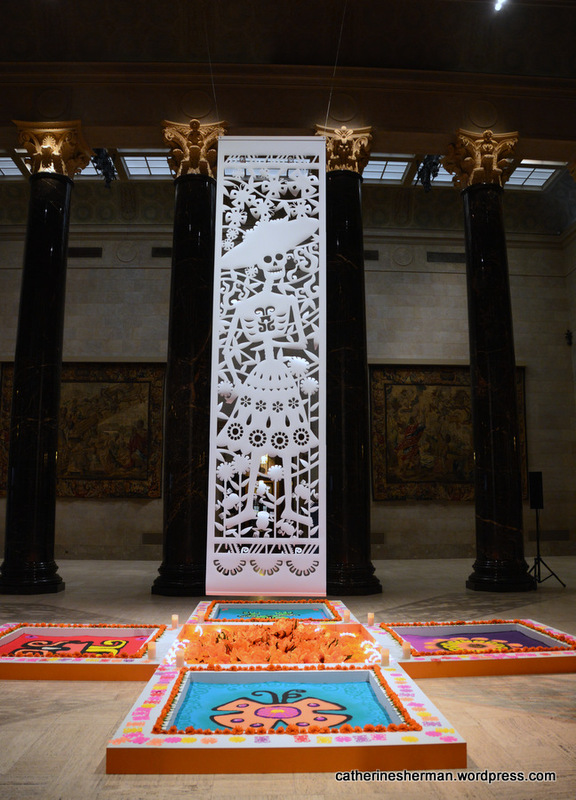 In the center is an altar featuring sand paintings honoring ancestors, highlighting the four elements of earth, wind, fire and water. Visitors are encouraged to write their own special remembrance. The festival art is done in collaboration with local artists through Mattie Rhodes Center. Music and dancing is scheduled for the festival on November 1, 2015. The museum is at 4525 Oak Street, Kansas City, Missouri. 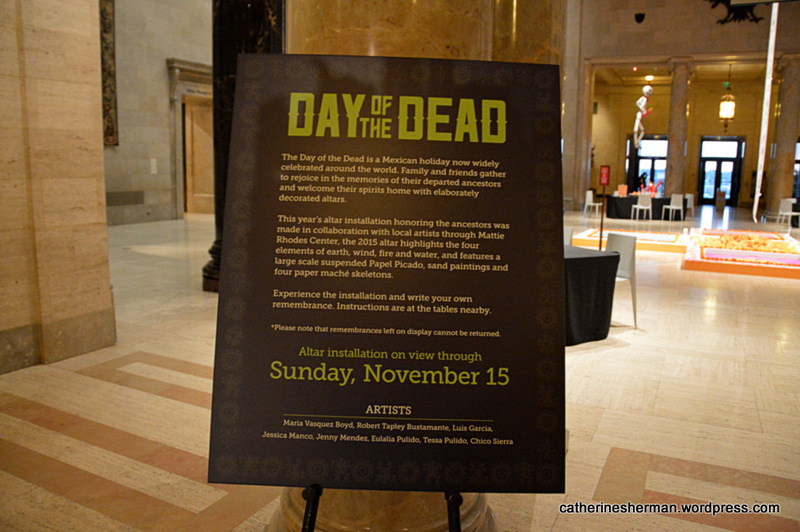 Nelson-Atkins Museum of Art Day of the Dead Festival. Dead of the Dead Poetry and Photographs. Day of the Dead Altar. Paper Mache Skeleton with Heart. 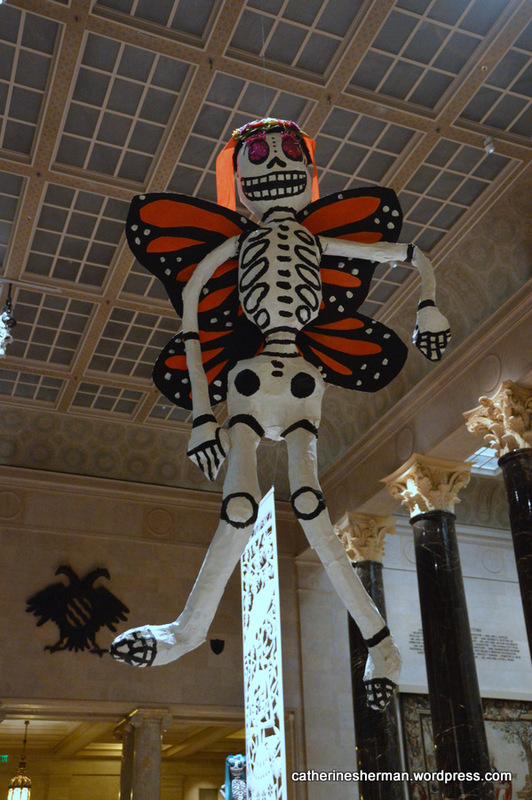 Paper Mache Skeleton with Monarch Butterfly Wings. Monarch butterflies winter in Mexico. A bride and groom and their attendants pose for a photograph at the overlook at Liberty Memorial in Kansas City, which has a great view of Union Station and downtown Kansas City. The four pylons of Bartle Hall are on the left of the skyline. I love photographing brides, whether they are relatives, friends or strangers. When I saw the beautiful wedding photographs from around the world in “There Goes the Bride!” by Terri and James Vance, I was inspired to look through my photographs of bridal parties. I’ve posted a few of my favorites here. 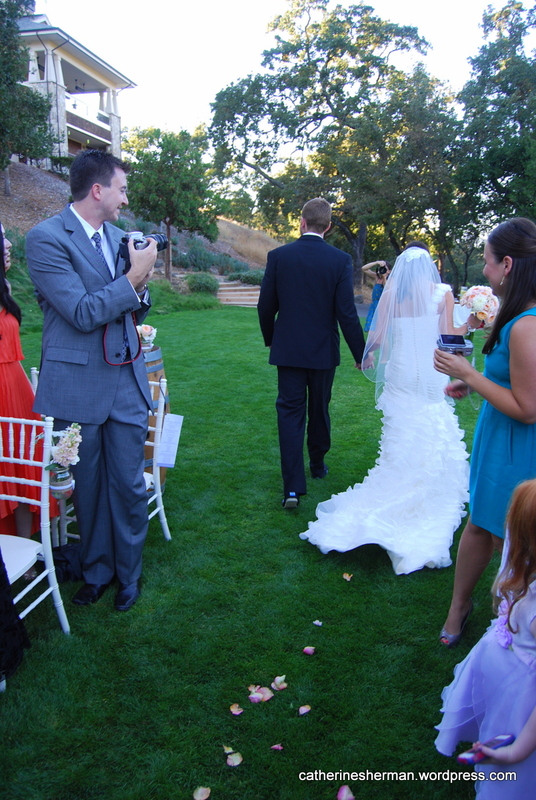 Unfortunately, I didn’t get a chance to take many photographs at my children’s weddings. Too busy! I also apologize to anyone whose view I may have blocked when I was trying to grab the perfect wedding shot. I lose my head when I see a bride. 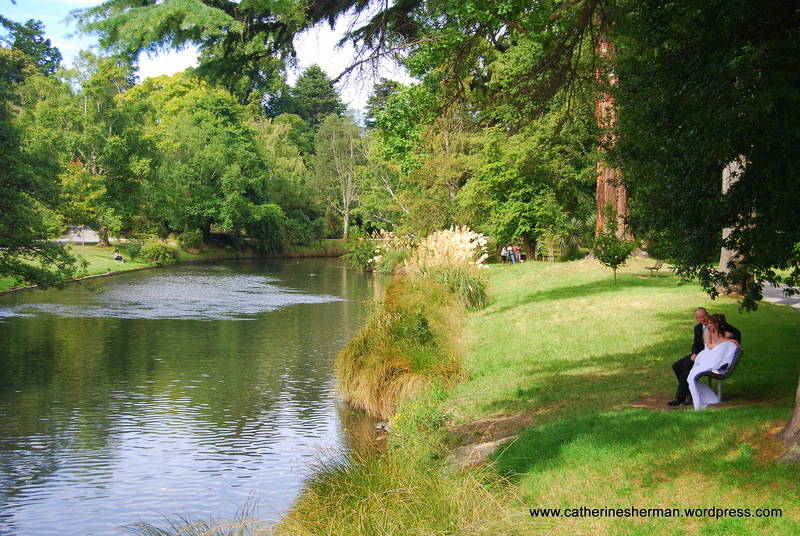 A bride and groom relax on a bench along the Avon River in Christchurch, New Zealand. 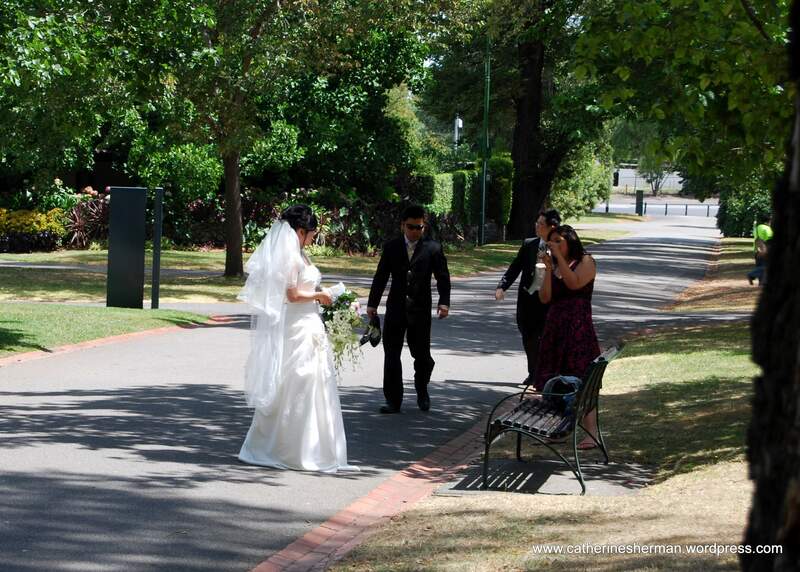 A wedding party gathers for photographs in Fitzroy Gardens in Melbourne, Australia. This bride laughs as she stops her wind-blown veil with her foot. She’s on her way to a park in Christchurch, New Zealand, to get her photograph taken. Here’s an elegant newlywed pair heading for their limousine after their wintertime wedding ceremony in the Kansas City area. 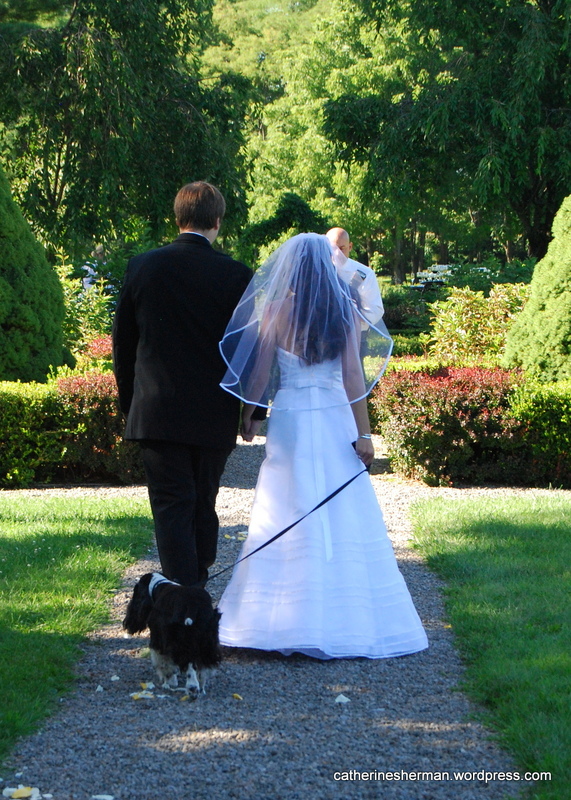 An English Cocker Spaniel walks down a garden path with her newlywed owners after their garden wedding near Ithaca, New York. 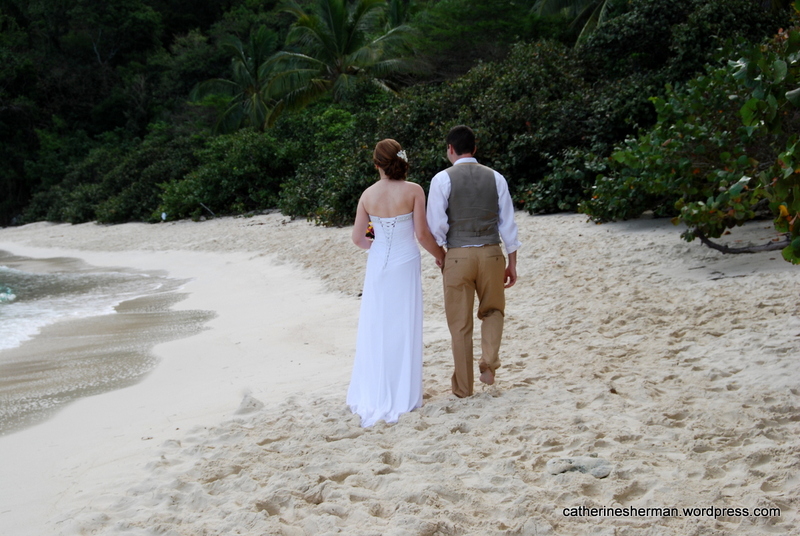 A bride and groom walk on a beach in St. John, Virgin Islands, which is a favorite for destination weddings. 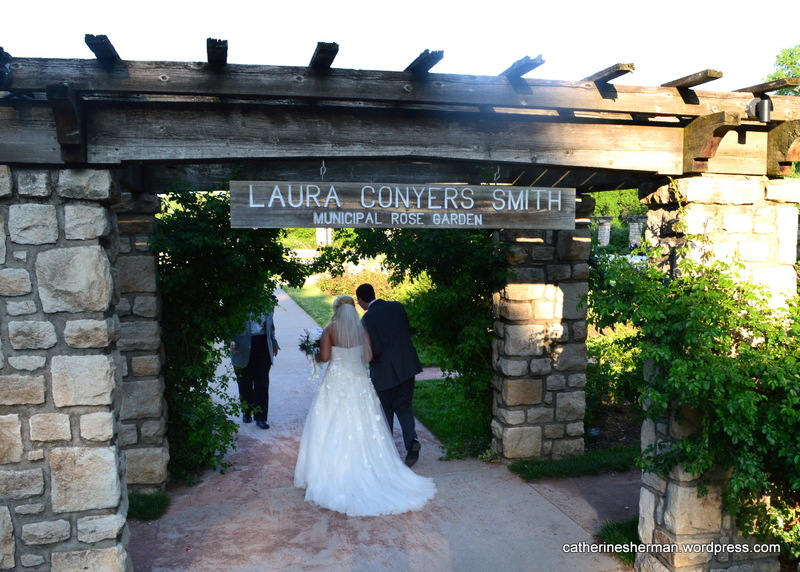 Newlyweds walk under a pergola at the Laura Conyers Smith Municipal Rose Garden in Kansas City, a popular spot for weddings. Every guest seems to have a camera to capture the bride and groom as they walk down the rose-strewn aisle in this Napa Valley, California, wedding. Bridal parties appear regularly at the Nelson-Museum of Art in Kansas City. I saw at least two bridal groups swarming the shuttlecocks on this day. 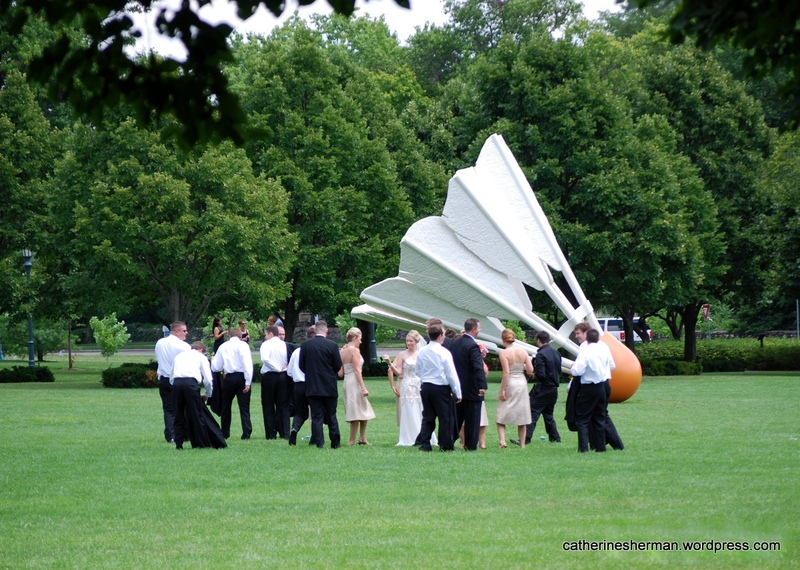 Brides and grooms love to get their photographs taken in front of one of the shuttlecocks at the Nelson-Atkins Museum of Art in Kansas City. A Kansas City Star photographer was shooting this bride and groom for a feature on the shuttlecocks when I took this photograph. They weren’t the only wedding party there that day being photographed in front of a shuttlecock. 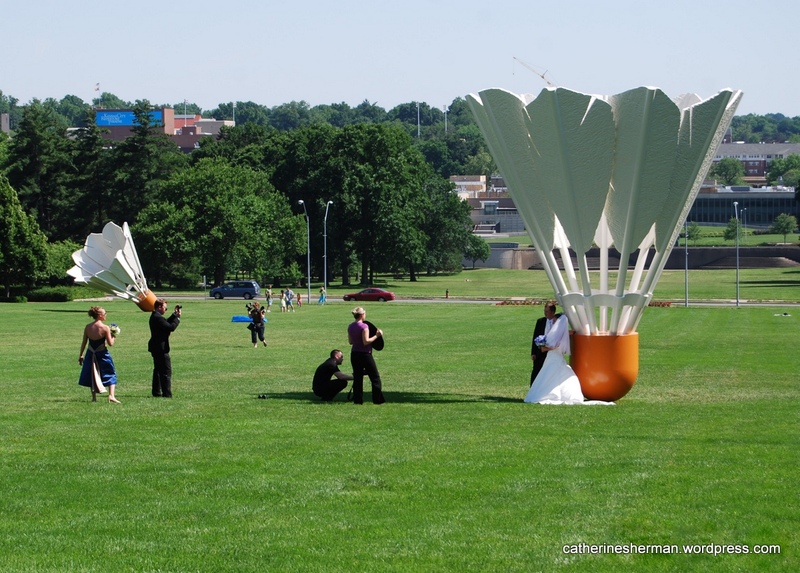 There are four of these shuttlecock sculptures at the museum, designed by sculptors Claes Oldenburg and Coosje van Bruggen. UPDATE: My husband took this photo on Signal Hill, Cape Town, South Africa, which we visited in January 2013. Photographing brides must be contagious! My husband took this photo while I was looking elsewhere and didn’t see this bride and groom. I think my husband might have been bitten briefly by the bride photo bug. 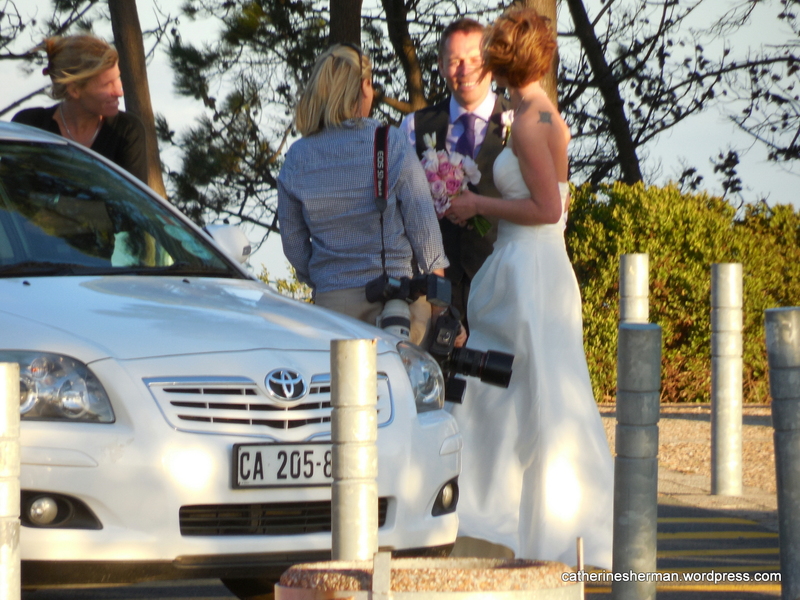 Here, a bride and groom consult with their photographer on Signal Hill in Cape Town, South Africa. Signal Hill provides a spectacular view of Table Bay and the city of Cape Town and makes a lovely spot for a wedding photo. To see larger versions of these photographs, click on the thumbnails below. 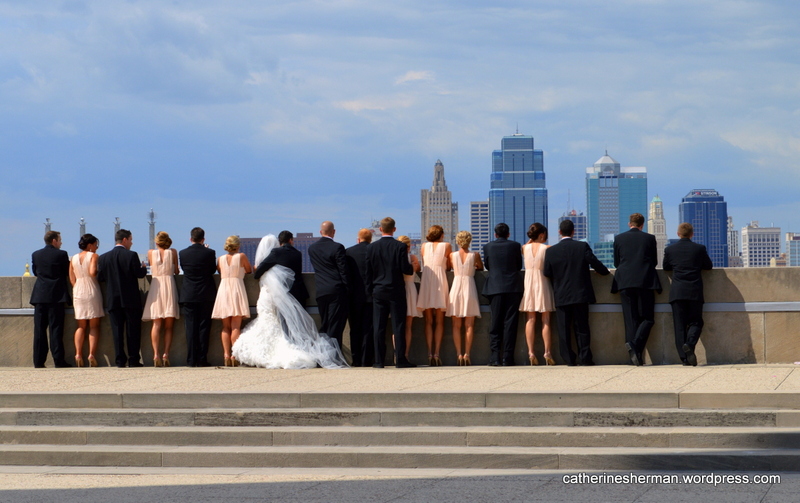 A bride and groom and their attendants pose for a photograph at the overlook at Liberty Memorial in Kansas City, which has a great view of Union Station and downtown Kansas City. This bride laughs as she stops her wind-blown veil with her foot. She’s on her way to a park in Christchurch to get her photograph taken. Here’s an elegant newlywed pair heading for their limousine after their wintertime wedding ceremony. Where in the Museum is Roy? 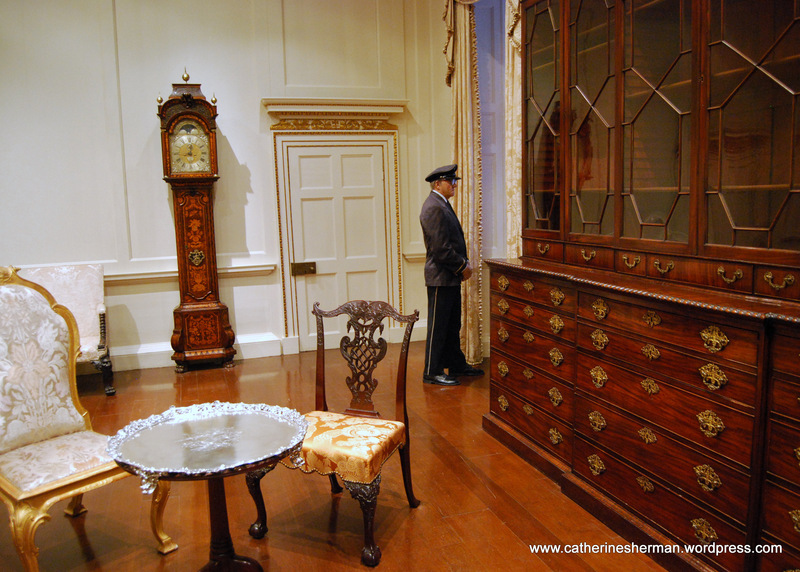 The Museum Guard "Roy,' a Duane Hanson sculpture, looks wistfully out a fake window in an 18th century re-created English room in the Nelson-Atkins Museum of Art in Kansas City, Missouri. Roy has been on duty at the museum since 2007. My daughter’s instincts were right. Roy was in one of the last rooms on our speed-viewing list, “The King’s Lynn Room,” an 18th century Georgian drawing room, originally from King’s Lynn, Norfolk, England. “Roy” is the nickname the Museum staff have named this old friend. Roy has spent most of his time in the Museum’s Bloch Building, which opened in 2007, but recently has been assigned to different galleries. Click here to read my post about one of Roy's recent assignments and about Duane Hanson, his creator. The first night, the boys raced through the snow in the dark with a flashlight, making tracks. We’d gotten rid of our sleds long ago (probably in some garage sale for nothing! ), but the next morning, the youngest boy found a piece of cardboard and “snowboarded” down a hill several times. Squirrels were fascinating creatures. Cardinals and woodpeckers were exotic. It was wonderful to see the world with a new perspective. When I drove them around, I pointed out what I knew. They also asked me plenty of questions I didn’t know the answer to, so I spent some time online when we got home learning more about my own city. We spoke the same language, yet we didn’t quite. Jumper, biscuit, council, fringe, bum. Familiar words, but with different meanings from American English. I’ve watched enough Masterpiece Theater that I knew what they were talking about, though. Thanks, PBS! New to me is bushwalking, which means hiking. In Australia, they are surrounded by birds we only see in cages, such as lorikeets and parrots. There are marsupials everywhere, while we have only one — the opossum. They have mandatory voting and are fined if they don’t vote. The Liberty Memorial is so tall you can't see the top! They checked regularly online for the cricket scores. There was a big game in Perth, Australia, against South Africa. Australia’s national cricket team is the highest ranked in the world. Cricket is played in a hundred countries. High-level “Test cricket” games can last up to five days with time outs for lunch and tea. I still don’t understand American football, so I can’t begin to explain cricket. All I know is that they use bats and wickets, and that one of the incarnations of Dr. Who wore a cricket uniform. We visited the National World War I Museum underneath the Liberty Memorial. Again, I saw the world through a different perspective. Their visit lasted too short a time. The next time I hope they can see our city in the summer. Soon I’ll be seeing the world from their point of view (and be a lot warmer, too) when we visit them in January. Our young guest from Sydney, Australia, contemplates the snowy view. Beyond, Auguste Rodin's "The Thinker" ponders the giant shuttlecocks that seemed to have landed on the snow in front of the Nelson Atkins Museum of Art.